(Nanowerk News) In an interdisciplinary collaboration between prominent academic and industry investigators, researchers have discovered a novel method for repositioning an FDA-approved anti-cancer compound so it can specifically target liver cancer tumors. A 'triple attack' technique combining chemotherapy, thermal ablation, and hyperthermia provided a highly targeted, yet minimally invasive approach. "In this study, we re-purposed the topical agent bexarotene (Targretin®) -- currently in limited use for cutaneous manifestations of T-cell lymphomas -- and re-engineered it for use in solid tumor applications by forming self-assembling nanobubbles," explained Dipanjan Pan, assistant professor of bioengineering at the University of Illinois at Urbana-Champaign, who led the study. "These tiny bubbles filled with Targretin in 'prodrug' form can be 'popped' to release the drug inside liver cancer cells, activating the prodrug during cellular internalization process. The probability of its undesired systemic release is minimal due to this highly selective activation mechanism, which helps to spare the healthy cells." The American Cancer Society estimated that by the end of this year, approximately 1.66 million new cancer cases will be diagnosed in the United States, and the figure goes up once the global statistics is taken into consideration. Developing new cancer-treatment drugs through a conventional drug discovery pipeline is time-consuming and expensive. One solution is to re-purpose a drug that is already approved for human use to treat a disease can be re-examined for treating other diseases. "Liver cancer is normally difficult to attack and usually requires significant surgical intervention," stated Santosh Misra, a postdoctoral research associate in Pan's laboratory and first author of the paper, published in ACS Nano ("Trimodal Therapy: Combining Hyperthermia with Re-purposed Bexarotene and Ultrasound for Treating Liver Cancer"), the premier nanotechnology journal of the American Chemical Society. 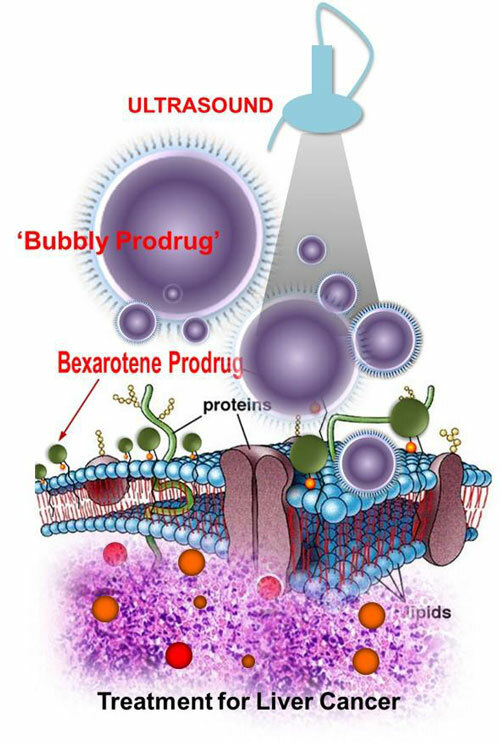 "In this study, we successfully re-purposed and repackaged bexarotene into a sensitive nanobubble form, inserted it directly into the tumor using a flexible catheter, and used ultrasound ablation therapy to 'pop' the bubbles to release the agent." The university researchers teamed up with a biomedical company Acoustic MedSystem to apply a newly designed catheter-based ultrasound therapeutic device with spatially tracked 3D ultrasound imaging. "Using an in vitro model of hepatocellular carcinoma and an in vivo large animal model of liver ablation, we demonstrated the effectiveness of bexarotene prodrug nanobubbles when used in conjunction with catheter-based ultrasound, thereby highlighting the therapeutic promise of this trimodal approach," Pan added. "Using a swine cancer model for drug screening is rare, providing us a great opportunity to study this new class of therapeutic nanobubble in a preclinical system closer to human. Furthermore, the study uniquely looks at the system from atomic to molecular to cell, tissue and then organ level. With this result in hand, the next step could be to test them in humans!"